Yes, it’s April. 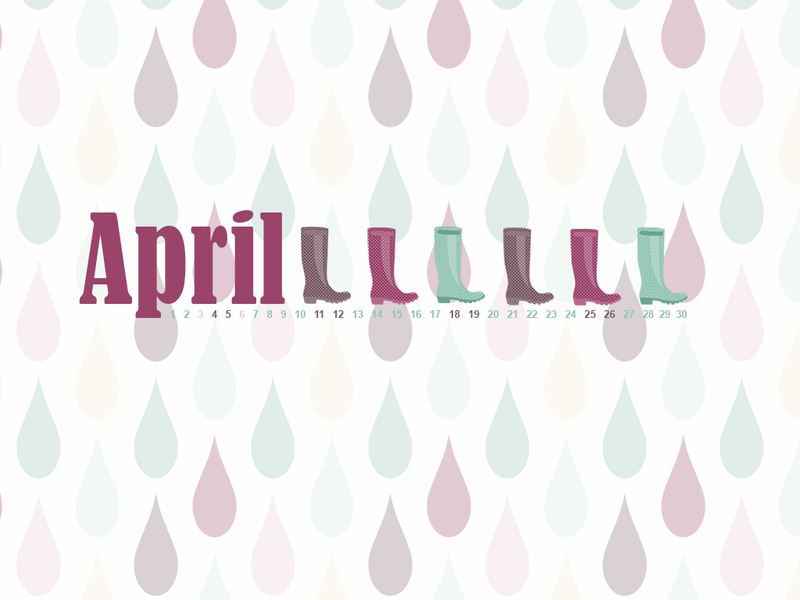 And along with all those April Showers comes the April aches and pains. Between Lewis’s knee and my feet, it doesn’t take much doing and going for us to start feeling it, especially with the ‘rain pain’. But . . . we are still doing and going. There was a time that much less than we have been going and doing would have done us in. But these days, we have a lot more get-up-and-go. When we talk about the path we’re following on the journey to wellness, this is what we’re talking about. And I’ve just changed it from ‘Journey to Wellness’ to “Journey to Awesome,” because this is pretty awesome! What is your Why? We are asked that pretty regularly when we start talking about goals. We really do need to know the Why. Until we know why we are doing something, our goals aren’t very important. We could accidently stumble upon goals that match up with our Why. But honestly, that’s pretty rare. Understanding your Why can mean the difference in success or failure. It’s that important. In order to find and clearly express your Why, you need to know what motivates you. What motivates you is often very personal and unique, but there are some motivators that many people share. This could explain why certain people are attracted to one another when they have seemingly nothing in common. But that’s another story. There are two types of motivation – intrinsic and extrinsic, or internal and external. Intrinsically refers to motivation that comes from within while extrinsic is based on factors outside yourself. WAIT! STOP! THIS ISN’T WHAT I WANTED TO TELL YOU!!!!! What I really wanted to tell you is that everyone has an itch that needs to be scratched. What scratches your itch? For me it’s several things – the need to teach, my longing for deeper relationships – not a lot of relationships, but deeper, my intense desire to go to new places and experience new things, my need, yes, need to learn new things – not just facts and information, but how to do new things. You see, all of those things are intrinsic. Usually, when you ask someone why they started a new business or new personal journey or whatever, you will hear things like “I’m sick and tired of being sick and tired,” or “I want to be debt-free,” or “I want my family to be able to take long vacations.” And no, there is absolutely nothing wrong with any of those reasons. But those are extrinsic. When it gets down to it, those things alone will not scratch that itch. I may well be that there is something about those things, buried and not on the surface, that is intrinsic and will scratch your itch. But discovering your itch makes it a whole lot easier to find what will scratch it. I love Network Marketing. With Young Living, I have finally found the Network Marketing business that I am truly passionate about and can stick with so my itch will be scratched. I’ve tried others – Stampin’ Up and Close To My Heart, both stamping/scrapbooking businesses – and learned a little about network marketing and myself. About myself, I learned that I love – no, I LOVE! – colors and patterns and textures. Yeah, I kind of knew that on the surface before these endeavors. But after immersing myself in the colors and patterns and textures, I realized it was something I couldn’t live without. (By the way, Young Living doesn’t really satisfy that hunger so I find other creative outlets.) But what I learned through Stampin’ Up and CTMH is that when network marketing is done right relationship bloom. And you know I’m all about the relationships! What I missed with Stampin’ Up and CTMH was the teaching, the learning, and the experiencing something I was passionate about. Yes, I could do all those things and it was a great learning experience. But it wasn’t something I was passionate about so I was pretty much just going through the motions. When you find that thing you are passionate about and it does scratch those itches, then you know you’ve found the place in the world that you should be. To be honest, though. It wasn’t the fault of Stampin’ Up or Close To My Heart. I wasn’t in a place or time in my life to be passionate about anything except growing my family. I had two teenage step-daughters in jr. high and high school. I was living in a new state (even after several years, it was still new to me). I had left my teaching career due to my health and was really floundering and searching for what I should be doing. If I had been introduced to either of these companies in the past year or so, I have no doubt things would be different with them. As with all things under God’s care, when Young Living came along, I was ready. When I was introduced to Young Living, it was by a dear friend in Arkansas who I met through Split Coast Stampers (a stamping/scrapbooking forum) years ago. When I joined as a Wholesale Member, I had no intention of building a business. But when I received my starter kit and saw what the products did for my family, I couldn’t keep my mouth closed. This was something that I was passionate about. And I could teach. And learn. And I met more people and deeper relationships began to grow. And I began to bloom. Young Living was scratching my itch! While reading all this, I hope you have been thinking about what scratches your itch. You may or may not already be involved in a business or activity that satisfies your intrinsic needs. If not, please take a few moments to think about activities you’ve been involved in in the past and how they satisfied you. What was it about the activities that kept drawing you back for more? What about them did/do you feel you couldn’t live without? What would you be doing right now if money was not an issue? When you find what scratches your itch, your WHY, then you will find your Purpose. I’m not really sure that I would include Fear of Failure or Anxiety on my list, but there is no doubt they can both be strong motivators. “Money” isn’t listed by name on the Psychologia list. But it, too, can be an intrinsic motivator. Some people simply enjoy making money and seeing the numbers grow. I suppose that would come under the category of ‘desire to achieve’. Since there were no specific instructions with the worksheet, I’ll just tell you what I did with it. I read through the list of 9 motivators. I filled in the blank in the first statement, listing 3 motivators I thought I would respond to best. Then I used the chart and circle the number of the two in each set that I would respond to better. After going through these, I counted how many times I circled each number and came up with my top 3. Two of my 3 were the same as those I predicted above. They were Autonomy, Affiliation, and Creativity. That was a little surprising in one sense, but not really. The teaching and learning that I expected (‘Search for Meaning’ is the closest motivator on the list) were not there. And what about numbers 1 and 9? Well, even though accomplishment and achievement are important to me, status is nowhere on the radar. And Security? Who doesn’t want security, right? Well, I guess there are different levels of security. In my life, I have security in my Lord, Jesus Christ, and in my husband and his unwavering love. No other security can even compare to that. At the same time, I love changes and am willing to take chances and risks to respond to my other motivators. In fact, not knowing the end result is part of what motivates me. But . . . in relation to my business, these were pretty much spot on. I am not in business for status, power, security, material rewards (though that is always nice! ), or several of the others you might expect. I have a network marketing business so I can be the one making the decisions, to build relationships, and to express my creativity. The creativity comes in the opportunity to do things my way. Even as I am attempting to lead my team with duplicable examples, I’m always free to ‘do my own thing’. I can try something new and see what happens. I can even follow in the steps of those who have gone before me, but infuse the activities with my own personality, including what ‘scratches my itch’. What you do in your business may not work be what I do in mine. But if it gets us to the same place, why not? But back to the assignment. Where does this lead me with my purpose? I think this pretty much says that I should have my own business and not be an employee of others. Right now I feel like my part-time job is killing me. Not just physically due to the inactivity required for the job – sitting at a computer, checking emails, sending messages, working on reports and data, etc. – but also for the soul-stifling work that it is. There are others who bloom in this setting. I’m just wilting. But that all goes back to the intrinsic motivators that make each of us unique and different. So, what do you think? 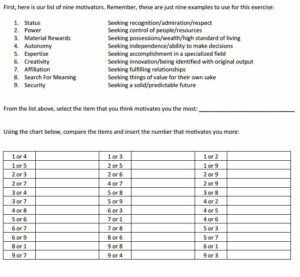 What are your intrinsic motivators? What scratches your itch? Tell me about it in the comments. By the way, this was supposed to be an article about Intrinsic v. Extrinsic motivators. But it’s all about Intrinsic. And I’m OK with that. By the way, Leonie is one of my most favorite people ever! She’s the kind of gal that makes you feel like her friend (I even referred to her as one of my ‘online friends’ recently!) even though I will probably never meet her in person. She’s one of my ‘kindred spirits’. We are Lewis and Teresa Levite, Young Living Wholesale Members. I prefer “Wholesale Members” because I don’t want to sell you anything. I will, however, show you how you can sign up to get your wholesale account and save money on great products – much the way you would become a member of Sam’s Club or Costco. Our goal is to introduce you to Young Living and Young Living products through our podcasts, periscope videos, newsletter, website, etc. Along the way with our journey back to wellness, we have learned a lot that’s not directly related to our Young Living Network Marketing business. Another of our goals is to share what we have learned with you. Some of this about food and wellness habits. Part of it is about goal setting and how to achieve those goals. Sometimes, it’s just encouragement along the way because that’s so important – for all of us! We named our Facebook page and group “Heart & Home”. That’s the name that we’re using for our website, Instagram and a few others sites. On others, like Twitter, I am ‘mrslevite’ because that’s what I’ve been for years and have followers through that name. I will have a list with links to our sites social media profiles and links to some of our favorite resources. When we moved here 2 ½ years ago, – and ‘here’ is the Village of Tilton, IL – there were a lot of changes going. Besides the new location and me learning my way around, I was without a job for a while and Lewis was transitioning from working to ‘retirement’. During the first year here, I gained weight, was given new medical diagnosis, and additional prescriptions. I was sick twice during that year requiring trips to the doctor and prescriptions for antibiotics and was prescribed several different allergy medications. When I decided enough was enough, I started asking my friend Darcy in AR about the oils she was using. She had told me before about her family using the Thieves blend to support their immune system. I placed an order for the Premium Starter Kit (I tend to jump in with both feet and wondered later if that was the best choice.) It turns out it was the best choice and the oils have changed our lives. Thieves was the jumping off point to a lifestyle of wellness. There have been some changes over the past year and half that you can see – like the weight that we have lost, Lewis more so than me, but slowly and steadily, it’s coming off. And some you can’t see – like the energy and focus I have to do my work – even when I really don’t want to. Also, our bodies are returning to a normal state instead of a diseased state and wellness is being restored. By supporting our bodies, it is healing itself. We have made other changes, too, but it was the oils that started this journey and the oils that continue to support our bodies as we continue the journey. We began with Essential Oils. Within a week of diffusing the oils, we all noticed improvement – me, Lewis, and the dogs. Diffusing is an economical way to use oils because a few drops are diffused over a period of several hours and everyone in the house benefits from those few drops. Some oils work better when ingested. The blend ‘DiGize’ is an excellent example. It supports a healthy digestive system. It will work when applied topically, but I think it’s stinky. It tastes nasty, too. But I would rather taste it for a minute or two instead of smelling it all day. You can also put a few drops in a gelatin capsule and not even taste it. That’s how I take oregano oil internally. Oregano is a ‘hot’ oil so I’ll only apply it topically to my feet. And I don’t usually want the house to smell like a pizzeria, so I put it in a capsule and take it with food. Some of the supplements that I’ve really been impressed with are the NingXia Red, Master Formula multivitamins, Mineral Essence, and Life 5 probiotics. NingXia Red is more a food than a supplement. From the website: “This sweet and tangy drink’s formula includes wolfberry, which is touted for its health benefits. Also featuring plum, aronia, cherry, blueberry, and pomegranate juices and extracts, Young Living’s NingXia Red is packed with superfoods to support overall wellness. This past fall, we started juicing. With a $20 ‘Restore’ juicer, we began drinking fresh vegetable and fruit juice for one meal per day. We don’t always get our juice, but if we miss it a couple of days in a row, we can definitely tell a difference how we feel and how well we can focus and deal with daily stress. Then we had No Added Sugar November and spilled over into No Added Sugar December. With Christmas and then baking a wedding cake, some sugar eased back in to my diet. Then I got sick and it was put on hold again. But I’m back in the saddle with only a bit of honey in my tea. Sweet fruits are easily digested and processed by my body (not increasing blood sugar levels) and satisfy my sweet tooth pretty well. For several years, we have been eating a (mostly) Gluten Free diet. Our digestive systems can definitely tell a difference. But we still don’t eat a lot of processed Gluten Free flour and grains. It makes cutting back on processed carbs a lot easier than if we were hooked on regular pasta and bread. These changes have been implemented a little at a time, one step at a time. By taking is slowly, the changes have been relatively painless and are long lasting. It’s been slow, but steady. Weight Loss is usually one of the first things people ask me about with Young Living products. There are products that support healthy weight loss. There is a “Slique” line of products – an oil blend, tea, chewing gum, meal replacement bars, etc. I have used the oil blend, but at the time I used it I didn’t have the rest of my diet in order and it wasn’t very effective. Now that we have a better grip on our eating habits, I’m going to try the Slique Essence Oil blend and the Slique capsules. I think these work best by helping you get your appetite and portions under control. There isn’t a magic pill. But even without the Slique products, we have lost weight. I’ve lost 20 lbs. and Lewis has lost even more. More Differences: We have not taken over the counter or prescription allergy medicines in over a year. Before Young Living, we were both taking Claritin, and often Benadryl and I was using Zyrtec and prescription nasal sprays. Even the dog needed Benadryl. Now we use lavender, lemon, and peppermint for acute symptoms. But by supporting our immune system our everyday symptoms have greatly decreased. I was on some pretty strong pain meds and we were both taking Ibuprofen daily. Now we are both off of those meds and use oils for muscle, joint, and nerve pain. We’re using safe, non-toxic, side-effect free natural options. After being told I was diabetic and needed to start taking medication, my blood sugar levels are normal and I’m not taking meds. And when I eat meals, I eat normal meals, not a restricted diet. Before Young Living, I was a regular visitor to my doctor’s office. In addition to the routine checkups to get my prescriptions renewed, I was having sinus infections pretty regularly. I haven’t had to go to the doctor for a sinus infection since we started using essential oils. This isn’t just about being fit and not taking medicine. This is about being in the best possible position to help others. If I’m sick and needing care, how can I care for others? I was put here to serve, not to be a burden to others. That’s my ‘why’ for improving my health. When we started using Essential Oils, it was just to support our various body systems and keep us above the wellness line. But we couldn’t keep it a secret and had to tell everyone. I don’t ever want to be guilty of not sharing something so powerful with people I care about. We now teach classes in our home and online and, 2 to 3 times a year, we host all day conferences to spread the news. Anyway. Look for links to the resources that resonate best with you and check back often to find out what’s new at Heart & Home.